With Cinco de Mayo just five days away, I wanted to share one of my favorite (and easy) Mexican recipes. This takes just a few steps and produces the most melt in your mouth carnitas I have ever made. It is the perfect base for a taco bar and a night of margaritas. I like to set out warm tortillas, crumbled queso fresco or cotija cheese, pickled red onions (recipe here), lots of chopped fresh cilantro and a variety of hot sauces. The recipe makes quite a bit, but you can certainly make even more for a large crowd. I like leftovers, as the carnitas are amazing the next day with fried eggs and tortillas. Put all the ingredients in a wide 6 to 7 quart heavy pot (don't worry if the pork is not completely covered) and bring the water to a boil, skimming the surface and discarding any froth that comes to the top. Lower the heat and simmer vigorously, stirring occasionally, until the pork is fork-tender. About 1 1/2 to 2 hours. Discard the orange pieces and bay leaves. If the liquid hasn't evaporated, leaving just the fat, after two hours, transfer the pork pieces to a bowl and let the liquid continue to bubble away, stirring often until it has. Preheat the oven to 450 degrees. Transfer the pork and fat to an ovenproof dish and brown, uncovered, in the oven for 20 to 30 minutes. This gives the pork that nice crisp on the outside. 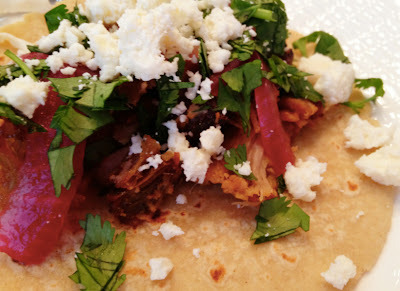 Carnitas keep in the refrigerator for up to three days. Note: If you want to make half a batch, cut the amount of pork, salt and oregano in half, but use the same amount of remaining ingredients and water.